2019 SnowDog Standard B13MER for sale in Traverse City, MI. 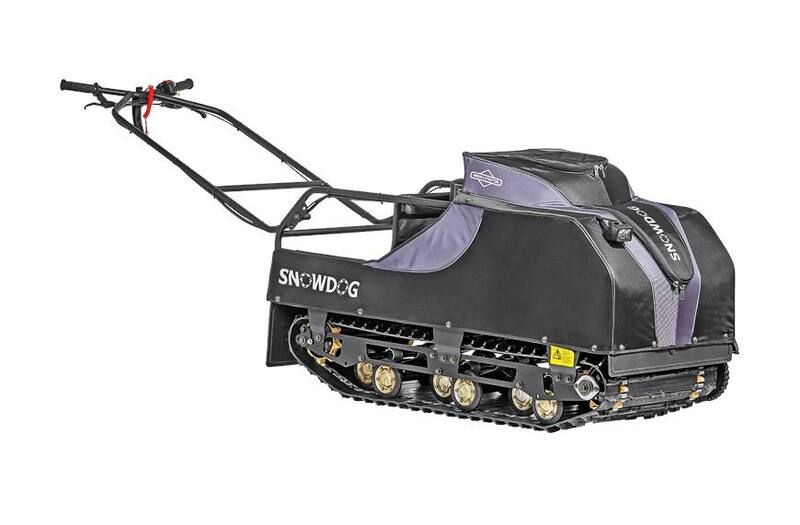 Lark Lawn & Garden, Inc.
SnowDog Standard B13MER is a reliable companion designed to take you long distances in deep snow pulling loads of 660+ lbs. With its longer track and frame, Standard models offer you improved off-road performance and more cargo space. It comes equipped with a powerful 13.5 hp Briggs&Stratton engine and a CVT. SnowDog Standard overcomes ice tracks, deep snow and rough terrain. Standard equipment includes LED light, electric starter, disk brakes and convenient engine cover. This model is equipped with reverse gear, for better operating in narrow space with little turning space. Engine - Powered by B&S: Four-stroke one-cylinder engine with balancer shaft; equipped with oil level sensor which stops the engine at overturn. Disc brake: For your safety always use parking brake when turning on the engine. Parking brake also can helps you to move up the hill. LED light: All models have LED light with a switch on the handlebar. High quality components: Only highest quality components from well-known suppliers are used in production of SnowDog. Original frame construction: Original frame construction protects engine from damage and forms a cargo hold. Folding handlebar with controls can be fixed in three operating position according to riders growth. Ergonomic handlebar: Can be fixed in three positions according to the riders height. Handlebar easily transforms from the transporting position with one motion. All models are equipped with security check for switching off the engine in case of emergency situation. High-durability powder coating. : All metal elements are covered by high-durability powder coating. Sleds made by Canadian technology from high quality materials. They are comfortable, durable and light. Sleds are fixed to the SnowDog with damper device to eliminate jiggle when accelerating and braking. Sleds are equipped with rails at the bottom for stable ride and drift reduction. Sleds can be equipped with removable seats which easily fasten and adjust to the size of the rider. For a more comfort ride, the seat includes a turning mechanism, shelf for small items and a glass-holder.